I have tried to hide it and wait as long as possible, but I just can’t hide it anymore. If you have wondered why I have been MIA for so long, it’s been a small part moving and packing, and a large part being in my first trimester of pregnancy. The thought of blogging, let alone sewing, seemed way too daunting for the last few months. But I am feeling so much better and am excited to be back! I am about 15 weeks and am due during the first week of February. We are thrilled. Congratulations! Best adventure in life! You look beautiful! Congratulations! And hope you enjoy my old stomping grounds, NYC! Congratulations! Hope all goes well. Congratulations! Hmmm yeah sewing in first semester did not happen for me either, yikes! Good luck with everything! CONGRATS!!!! This is such exciting news!! Congratulations to you all!! Such exciting news! Congratulations! You will have one stylish kiddo! I know it! Congratulations! I agree with you. When you are in one if those feelin’ no good times, sewing does seem very daunting, no matter how much you love it! Awesome!!!! Can’t wait to see what maternity/baby projects you have in store. Congrats to all 3 of you! Miss you guys!!! Oh my gosh, packing and pregnant, you must be exhausted…though still looking gorgeous! Congratulations!!! Oh congratulations, Kelli!!! How wonderful. Um yeah, you’ve had just a little bit going on lately, haha! Take care, hope you’re feeling good. Congratulations! You have been a busy lady! I think I would be sound asleep each afternoon if I was you. Oooh congratulations! Can’t wait to see all the refashions and preg-mods you do this time. Congratulations, that’s wonderful news. Hope everything is going well for you. I was starting to wonder after seeing all your maternity clothing pins. Congrats! you look great! I love the outfit! Congratulations! Can’t wait to see what cute things you whip up. How wonderful! That first trimester can be rough. Glad to see you’re bouncing back. So very happy for you! You look gorgeous!! Cats out of the bag! Congratulations again. 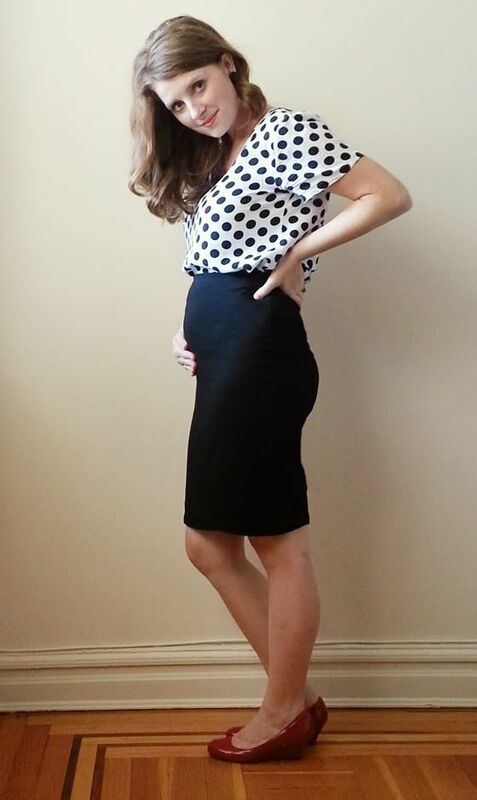 I’m curious to see if you see what you sew for maternity wear. Congratulations! Also, I LOVE your top! Did you make it? Thanks Julia, I did make it, its the grainline scout tee pattern. Thanks everyone for all of the congratulations. You are so sweet. And thanks for being patient with my lack of blogging and not giving up on me. Most glamorous pregnancy shot ever! You look beautiful. Excited to hear this happy news. Alpha will be a wonderful big sister.